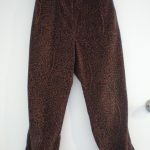 When harem pants came into fashion a few years ago, I thought of them as a fad; until I tried a pair on myself! They are really comfortable, and flattering, thanks to the ruching around the crutch which then tapers into a narrow leg opening. 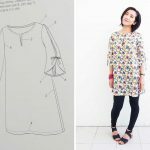 This sewing pattern is from the Japanese sewing book, Happy Homemade Sew Chic. The book calls it ‘Design L: Straight-cut Sarouel Pants’. I’m not sure what sarouel pants are, but these to me are harem pants, and they are indeed straight-cut. The sewing pattern is simply 3 pieces of fabric, plus 2 rectangles for the pockets. You can make these pants in a few hours. To save time, I only traced the patten for the leg piece. For the center panel and pockets, I simply measured the sewing pattern and drew rectangles on the fabric directly. Yay for straight-cut! Happy Homemade Sew Chic is available from Amazon in English. Here’s the YouTube video review for this book! The book recommends fabrics like hemp and jersey for this sewing pattern. I purchased my brown batik fabric in Indonesia last year. I used some to make my husband an up-side down pocket t-shirt,but had just the right amount left to make these pants. I think any mid to heavy weight fabric would work well. I’d stay away from linen though, because that stuff just wrinkles all the time and it wouldn’t work so well with the ruching. The batik had two different patterns going on, so I used the more intricate, diamond part for the pockets. 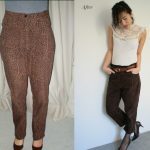 I practically live in skinny jeans, so elastic waisted loose pants like these are such a nice change! I wear them lounging around the house a lot, and I also wore them in Mexico with my T-shirt refashioned sequin halter top. Teamed with gold sandals and big earrings, it made a cool (as in temperature cool) outfit for dining out in Tulum. Rin, this pants are so nice, and you look great on them!!!! Do you think some kind of rayon or challis would work too? It is so nice to see people trying this patterns and making a great success out of them! Amazing I have to say, well done!! Now I’m off to trace this pattern!! Thanks for this post and the video. Hmm they do recommend jersey as one of the fabrics for this pattern, so a slinky fabric like challis might just work. Just make sure it’s a darker fabric! Thanks so much for your comments on my batik version! I think slightly stiff fabric like batik or even light denim works really well. These are lovely, I really like the use of the different pattern on the pockets. I bought fabric with these in mind in the summer and now with the chill of Autumn firmly in the air I am hoping the fad for Harem stays till next year. Thanks Louise 🙂 Pretty sure harem is staying around. These pants serious take just a few hours to whip up, so it’s totally worth it. I live in mine – they are so comfortable! So interesting to see these made up. I keep going back and forth about the pattern. They do look super comfy! I think the key is to pick a fabric that’s not too stiff. Oh and a darker colour is always more flattering on the bottom half! I just tried to make these and used my measurements to judge what size to make rather than my usual size and they were seriously HUGE!!! Did you make your usual size pants? Hi Luanne – Yes I did, make my usual size. They are a kind of a baggy fit though. I am making the sarouel pants, but can’t seem to find the center panel on the pattern. Can you tell me witch page they are on? is it on the same page as the legs, or the pocket? Hi Tisha! The centre panel does not have a sewing pattern, you need to draft it yourself. There’s instructions on p49. It’s just a rectangle, so it’s really easy. I came looking for the center panel pattern piece. Thank you for clarifying that I needed to draft it. I was getting exasperated! You’re welcome Jill! Hope the pants turn out well for you. I received her book , but there is no apnts pattern included. There are two folded pattern sheets, but I don’t see the pants anywhere. Did I get a defective book? Hi Meg – there should definitely be a pants pattern in the book. The middle crotch bit is the only section you have to draft yourself using the instructions in the book. Hello, I have sewn several patterns in this book and I always size down. However I was wondering what size from the book you sewed these in. You are right around my size and I would love to know what pattern size you used from the book. Sorry if this comment is late. Thank you for your time. 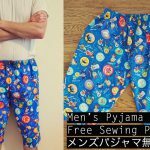 I usually sew size M from Japanese sewing books. Hope that helps!